At Viney Hearing Care, we use a comprehensive range of tests and fitting procedures that represent best clinical practice. We find the right solution for each person, with the highest quality of aftercare to ensure hearing instruments are fitted correctly and working effectively. Here we have outlined the patient journey in 5 steps. This explains what happens in each appointment through the entire process of successful hearing rehabilitation. Next we perform Pure Tone Audiometry. This test involves you wearing a set of headphones and pressing a button in response to a series of pure tones. 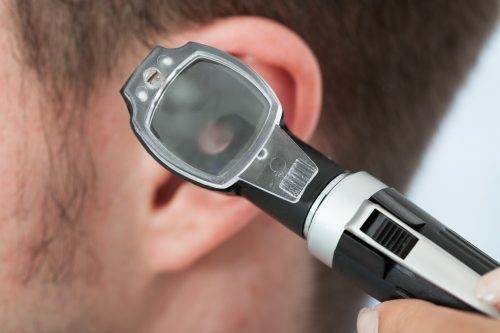 This test helps us determine the degree, type and nature of your hearing loss. Next is the speech discrimination in noise test, which tests your ability to hear speech both in quiet and in background noise. You will be asked to sit in front of a calibrated loudspeaker and repeat out loud a series of words and sentences, which will be played to you with different volume levels of noise in the background. This is used to determine how your hearing affects your ability to process speech in a quiet environment and your ability to understand speech in background noise. We can then compare these results to those we would expect from a normal hearing person. Why do we perform a Speech in Noise Test? Hearing speech in background noise is the main difficulty for anyone with a hearing loss, it is the main issue that needs to be addressed – so doesn’t it make sense to test this? Pure tone Audiometry, which is the basic test performed by all audiologists and hearing aid dispensers only predicts speech discrimination in noise, the speech in noise test actually measures it. This is very important as two people with exactly the same hearing loss can have very different abilities to discriminate speech in noise. By performing a speech in noise test we can more accurately determine the right hearing aid for you and the features required. And by repeating the test after the hearing aids have been fitted we can objectively determine how effective they are. We take the time to thoroughly explain your test results to you and give you a clinical diagnosis of your hearing loss. Style. The right style of device to be as discreet or invisible as possible while providing adequate benefit. Price. We have a range of prices to suit every budget. We will show you examples of several different suitable products from a range of manufacturers and discuss the most appropriate choice for you. First of all tiny probe microphones are placed in your ears, so that we can measure the exact levels of sound arriving at your eardrum. The output from the microphone is displayed on a screen for you to see. We then put in your hearing aids and play a series of calibrated signals such as speech and music. We can then see the exact level of sound being produced by the hearing aids in your ears and whether the hearing aid is adequately restoring audibility of sounds that you could not hear before. We compare this level to a pre-determined prescription target and adjust the hearing aids to ensure that they are adequately meeting the target, which has been calculated from your hearing test results. We then make sure that you are totally happy and comfortable with the sound of the hearing aids. We will also show you how to handle your hearing aids and make sure that you feel confident using them. Once your hearing aids are properly fitted and verified, you’ll be able to take them home and start using them. It is a good idea to get used to your hearing aids in familiar and comfortable situations, such as watching television or speaking to family. Start by wearing them for short periods and gradually increase it. Once you have got used to your hearing aids you can wear them all the time. Speech, music and television will all sound louder, sharper and clearer, making it easier to hear. Consonants such as ‘s’, ‘t’ and ‘ch’ will sound more defined. You may now hear sounds around you that before were inaudible or very quiet: things like footsteps on wooden floors, ticking clocks, and bird song. Your own voice will also sound different. As you use your hearing aids in your normal life, you will get more and more of an idea of how much they are helping you, and where any adjustments need to be made. We’ll arrange for two follow up appointments around two and four weeks after the initial fitting so you can let us know how you’ve been getting on. We will discuss your listening goals that we talked about in the initial assessment and determine how well your goals are being met by using the hearing aids; this gives us clear evidence of the benefit that you are getting. At this point we can make fine tuning adjustments to your hearing aids to further personalise the sound for you. This process of fine-tuning can make all the difference in the long run: it helps you get the most from your hearing aids, and allows you to use them to their greatest efficiency. To help us complete this process effectively we have installed a ‘Surround Sound’ system in our clinic, so that we can accurately re-create difficult listening environments such as busy restaurants, cocktail parties or street noise. This is invaluable in measuring the performance of the hearing aids noise reduction features. We then repeat the Speech Discrimination in noise tests that we performed in the initial assessment but this time you will be wearing your hearing aids. We compare your scores before and after the hearing aid fitting and we should see a significant improvement. This gives us objective, documented evidence that your hearing aid fitting has been successful. If for any reason we have not been successful then we can try a different set of hearing aids. However, it is very rarely necessary for patients to return hearing aids to us. Our success rate is extremely high. It’s this kind of commitment to service that makes Viney Hearing Care your best choice for hearing aids and hearing consultation. You can come in and see us for ear health check, adjustments or ‘fine tuning’ any time you like for the lifetime of the instruments. All of our patients continue to get free ear health care and wax management, this incudes microsuction wax removal and advice on the best way to take care of your ears and hearing instruments. We will invite you to attend 6 monthly ‘check up’ appointments where you will have an ear health check, a review of your hearing goals. The instruments will be serviced, cleaned and tested to make sure that they are working well for you. Then we have an annual ‘Reassessment’ appointment where we will re-test your hearing, check the hearing aids and re-calibrate them should your hearing have changed. We will then retest and compare your speech in noise results. This will ensure you continue to get maximum benefit from your hearing aids. Hearing aids are sophisticated instruments but it’s important to remember that they can go wrong from time to time. Also, your hearing can change over time and this needs to be taken into account. That is why it is very important to have a reliable aftercare service when using hearing aids. With Viney Hearing Care you can have total peace of mind, knowing that should anything go wrong with your hearing instruments we will take full responsibility to ensure they get repaired and back to you in working order as quickly as possible. We can even arrange for you to have a loan hearing aid whilst your aid is off for repair.